Osceola REDI (Recovery from Emergency Disaster Initiative) is a coalition of governmental agencies, faith-based and non-profit organizations, businesses, and individuals dedicated to assisting those who have been victims of disaster by pooling community resources and assistance. Our non-profit organization provides comprehensive and integrated emergency management assistance to help Osceola County, Florida prepare, respond and recover from disasters that may impact our county. We help ensure programs and protocols are in place to ensure Osceola County is prepared before, during and after a disaster. To provide a comprehensive and integrated emergency management assistance system that coordinates with Osceola County, Florida and community resources to protect lives, property and the environment through mitigation, preparedness and response, with a focus on the recovery from disasters that may impact our county. Osceola REDI was called into action to support community response efforts after the UNNO Hotel Fire December 23, 2016. 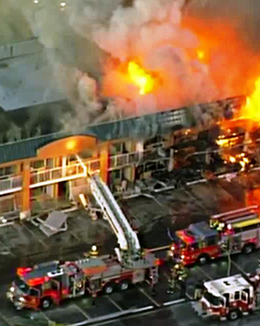 An estimated 250 people were displaced by the fire that started in the rear of the 130-room property. Red Cross and other emergency services agencies stepped up to meet immediate housing needs, but it was soon recognized additional support was needed to take care of these individuals and families, especially during the holiday season. REDI helped secure financial donations to cover the costs to temporarily house the families through the holiday season. The community’s generosity was overwhelming as we received more than $20,000 toward housing these displaced families. Based on lessons learned from the 2004-05 hurricane season, Osceola REDI prepared and closely monitored Hurricane Irma. Once the storm had passed, initial assessments indicated minimal damage to Osceola County. However, REDI learned of citizens who experienced damage and debris. 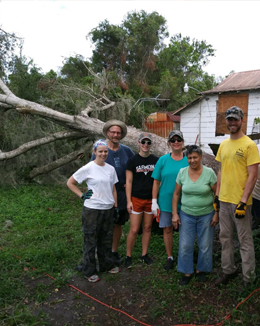 REDI, in partnership with Osceola County Emergency Management, identified residents in need and helped deploy volunteers to sort donated goods, clear debris and offer other support services.